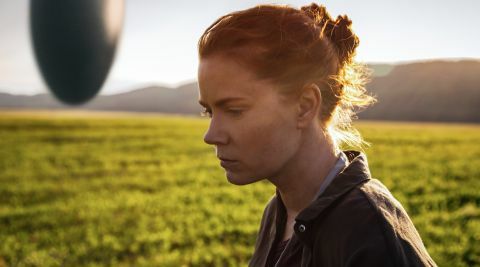 Arrival review: "An intelligent, eloquent, and stirring sci-fi that grips from start to finish"
An intelligent, eloquent and stirring sci-fi that grips from start to finish, Arrival is up there with the year’s best movies. While it won’t be off-putting to those sceptical about sci-fi, the film contains plenty to delight genre fans. The gravity-shift boarding of the spacecraft recalls visuals from 2001: A Space Odyssey. The alien creatures feel organic and believable, even if the CGI isn’t always perfect. DP Bradford Young (stepping in for Villeneuve’s Prisoners/Sicario/Blade Runner sequel cinematographer Roger Deakins) elegantly captures the scale of the visiting craft and the claustrophobic corridors of the military basecamp at which Banks and Donnelly are stationed. Sparely used flashbacks have a haunting quality, and are given heart-stabbing heft by Jóhann Jóhannsson’s painfully poignant score. Fascinating as it is to watch Banks and Donnelly’s developing interactions with the heptapods, the tension ratchets up as the 11 other sites grow antsy of waiting too long to uncover the meaning behind the arrival. Have they come to get us to work together, or to drive us apart? Of particular concern is China’s military leader General Shang (Tzi Ma), who is itching to go on the offensive. Without hammering its message, Arrival’s advocacy for communication across all boundaries couldn’t feel more timely.